According to a Biafran Media personal has reveal that Evidences have emerged that the hand sign done by Nigerian President Jubril Aminu Al Sudani (Buhari’s double) while trying to hide his PALM LINES during the 2019 budget presentation, is called RABIA. 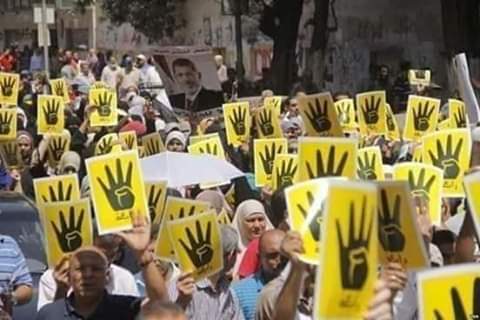 In a clear statement issued by Somto Okonkwo confirmed It is a symbol associated with the ISLAMIC BROTHERHOOD, a dreaded terrorist group, that even Islamic nations like UAE and Egypt has disbanded and The Nigerian President used the sign in solidarity to the Islamic Brotherhood! "How can Nigerians be this gullible. No wonder their leaders take them for a ride. That's why their so-called government can't even approve the N30,000 minimum wage", He Said. Speaking boldly to the masses that It is NOT about four more years for Jubril-Buhari. It is more malefic than that. Think!